Names of children who died in Tuam placed at the Garden of Remembrance Dublin. The commission this morning published its 96-page fifth interim report and also provided details about burial arrangements at the institutions. The report investigated the use by medical schools of the bodies of children who died in the homes. In particular, how these bodies were buried afterwards. The commission reports that between 1920 and October 1977, the bodies of more than 950 children from Dublin institutions were sent to medical schools for anatomical studies. The vast majority of these children were recorded as “illegitimate”. “The Combined Anatomical Register of the Dublin Medical Schools records that all but 18 of the children received as anatomical subjects were “illegitimate” children. Children used as anatomical subjects in the Dublin Medical Schools were aged between 10 minutes and 15 years at the time of death,” the report states. It adds that “the burials of the anatomical subjects used by the Dublin Medical Schools are properly recorded in Glasnevin Cemetery”. The bodies of the children were buried “in the Poor Ground section of Glasnevin Cemetery”, the report states. In the case of the Galway medical schools, it was not possible to determine details about how these bodies were buried. “It has not been possible to establish anything about the burials of the child anatomical subjects used in the Galway Medical School as their names are not known,” the report states. The report states that the sending of deceased residents from institutions to medical schools was “common practice across the UK and Ireland until the mid-1960s”. The commission report also found that there is “very little basis for the theory” that children from the Tuam mother and baby home were “sold” to United States. “In the Commission’s view, there is very little basis for the theory that the children concerned did not die but were “sold” to America,” the report states. Children from Tuam were adopted to America (as were children from nearly all the institutions under investigation). These adoptions are generally recorded in the Tuam records. It is not obvious why subterfuges would be required to arrange such adoptions. The report says that a total of 973 children from the Tuam children’s home died either in Glenamaddy, in the Tuam Home itself or in a hospital or institution soon after they were transferred there. It also found that 12 mothers who were resident in the Tuam Home died, the majority from complications of childbirth. 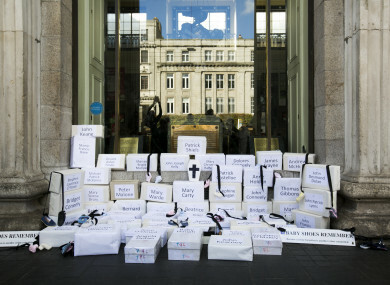 Email “Mother and baby homes: Almost 1,000 dead children from Dublin homes sent for medical use ”. Feedback on “Mother and baby homes: Almost 1,000 dead children from Dublin homes sent for medical use ”.